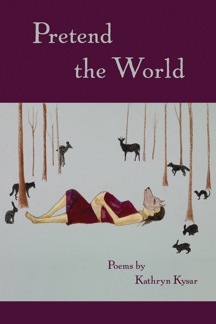 Kathryn Kysar’s collection of poems, Pretend the World, published by Minnesota’s Holy Cow! Press, heaves with the natural world, motherhood, war, and rock n’ roll. The gems in this collection are plenty and shiny. Kysar is one of those writers who effortlessly links the natural world to current events – which is something extremely difficult to do effectively without sounding contrived. In her poem “Last October,” she writes: “The goose, fat and / heavy at the lake’s edge, / is the weight of war / in a mother’s heart.” With simple grace, Kysar transitions to heavier and more controversial topics, adding a new level of perception to our surrounding great outdoors. Another one of Kysar’s strengths is her ability to surprise the reader with unexpected connections and transition, without leaving the reader behind. A pleasantly surprising poem: “The Effects of Loud Rock and Roll on an Unborn Fetus.” This poem begins with a baby in a womb getting to know the natural sway and habits of its mother. Then, the tone switches with the baby being exposed to the raw gasps and screams of rock n’ roll, absorbing the music’s pulse through the mother’s body. The only thing holding this collection back are instances in which Kysar lets herself get wordy. The occasional run-on sentences teeming with adjectives disrupt the natural pace. This could be avoided by manipulating breath and stops through punctuation or form. She does a lot of formal experimentation in Act 3 of the collection that I wish could’ve been sprinkled throughout the dense first two Acts. I ran tech at the Loft for the release event of this book and have been kicking myself for not picking it up while I was there. (In my defense, I had little cash, but she was donating money to a relief fund in Japan.) The event itself was really interesting as it featured about 20 other writers reading selections from the book. It’s hard for me to get a complete sense if poems when they’re being read to me so perhaps the fact that I only connected to about a third of the poems had something to do with each individual reader’s interpretation more than the content. After reading this review I’d like to sit down with the book on my own to revisit the poems in a different way. I was wishing I could’ve gone to that event! That’s so interesting, that she had other writers reading from the book! Usually we writers are so protective about reading from our own work…interesting commentary on her own collection. I can imagine that would be a lot to digest, though. And hey, if you want to borrow mine, just let me know! It was certainly a different format, but it allowed for a wide variety of nuance in the event itself. It also allowed Kysar to relax for a minute and just celebrate the publication of her book. She also did an interesting thing that she said she often does at readings: she read a couple of poems written by other writers. I don’t remember exactly who she read, but the poems were influences of hers and also fit with the general themes of her book. It made sense, but I’d never really seen a poet do something like that (outside of the slam circuit). I’d love to borrow the book at some point! We can do a book swap or something.